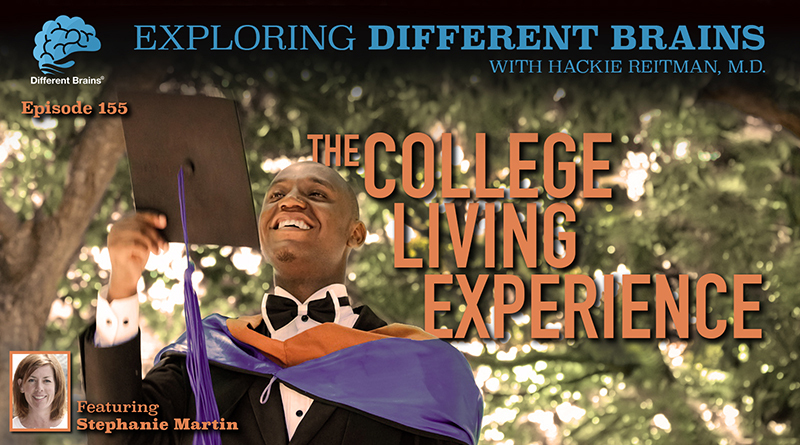 In this episode, Dr. Hackie Reitman speaks with Stephanie Martin, president of the College Living Experience (CLE). 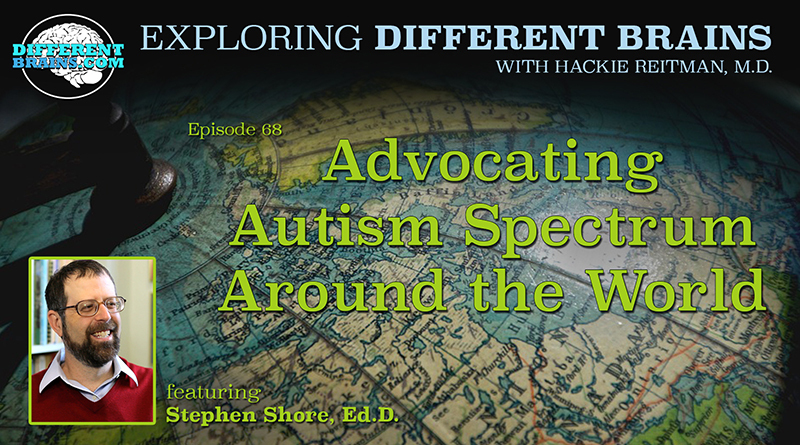 (22 minutes) Stephanie has spent her career working with students with varying disabilities of all ages. Being an Educator first and foremost, Stephanie brings her unique perspective and unwavering passion of supporting the special education community through the innovative services of CLE. She focuses on co-creating an environment where students have a maximized opportunity to be their own self-determined advocates with the necessary skills to be successful. Stephanie discusses the mission of CLE, the importance of students developing self-determination, and why sometimes parents needs to give their kids a chance to fail. HACKIE REITMAN, M.D. (HR): Hi, I’m Dr. Hackie Reitman. Welcome to another episode of Exploring Different Brains, and today I’m excited to have with us Stephanie Martin, who is the big cheese over there at the College Living Experience, and we’re going to hear all about and learn all about the College Living Experience. 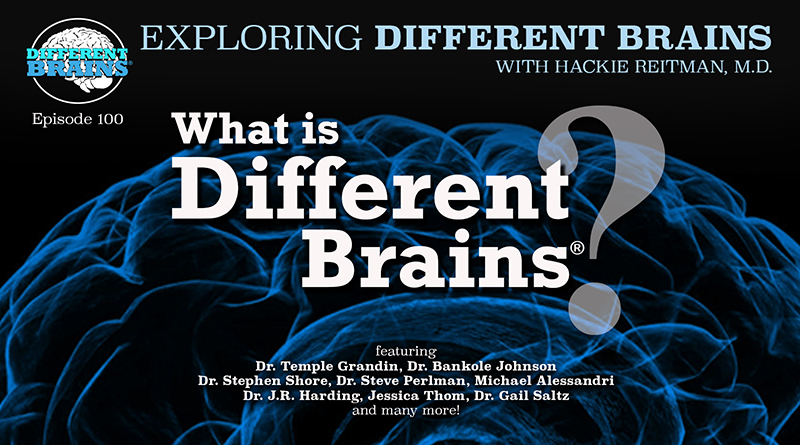 Stephanie Martin, welcome to Exploring Different Brains . STEPHANIE MARTIN (SM): Thank you. Thank you for having me. What is the College Living Experience? HR: Thank you for being here. Now why don’t you introduce yourself to our audience properly? SM: Okay. I’m Stephanie Martin. I’m the president of College Living Experience. CLE, College Living Experience, has been around since 1989. It started in Florida and we had… there was one center, and it has subsequently just grown from there. We now have six centers across the United States, and we serve roughly 200 students a year and – with a wide variety of unique abilities and variabilities and – I’m just really pleased to be here and talk a little bit more about College Living Experience. HR: Well, how did you get into all of that? SM: I’ve been in special education for about 25 years. Does that date me? Probably, it’s okay. I’m alright with it. I started out as a teacher working with individuals who had significant emotional disturbances and then, just through that process, worked my way into classrooms that had a wide variety of students with disabilities and found my way towards working with individuals with autism, and I worked for a company out in California for a long time where we set… where… as a behavior analyst and worked in public school classrooms to help teachers find ways and interventions to help students with a lot of different disabilities to be more successful in that inclusive setting, so I started that way and then had a great opportunity to take that experience and open up some early intervention programs across the United States, and from there, I was introduced to College Living Experience and recognized that, well, we have a lot of supports and services for young children and with disabilities. We tend to see those support services really drop off after high school, so for me, this was just a huge opportunity to try and figure out a way that we could expand our supports and services and reach of greater number of individuals. HR: Yes. We have inadvertently, in our well-meaning society, discriminated against adults. You know, everything’s the cute little kids and everything, well, the little kids turn into adults. Here at Differentbrains.org, we limit our internships to above 18-year old and we find agreeing with you. They kind of get the short end of the stick a little bit. So, the College Living Experience now say someone in our audience is about to make a transition from high school into college, alright? How do they find you? How did they find you ahead of time and might help them choose a college? Tell us the process. SM: There’s a couple different ways that families find their way to CLE, I think, predominantly is, the major way is through the internet and/or word of mouth because, you know, the world of disabilities is a pretty tight-knit community, and so, when one family or one individual has success, then that kind of spreads like wildfire. The other way is through education consultants, and education consultants are individuals that help families find colleges for their children, and there are specific education consultants that work with families who have kids with disabilities, and so they’re not only looking for a college but they’re making sure that either that college has the necessary supports and/or they’re looking for a program that’s going to be similar to what College Living Experience is, in terms of it having a very wide scope of wraparound support so that we’re going to look at the whole individual and not just at the academics or the educational focus for those students while they’re in the post secondary setting. HR: So let’s say one of our interns is finishing through whatever program they’re in in high school, they’re thinking of going to go on a college, and they contact you and their parents contact you. What happens? SM: They typically will speak with our national admissions advisor. Her name is Holly, and Holly will walk the family through not only the process but ask specific questions that are unique to that particular student, so, “What are they looking for?”, “What are their interests?”, what their disability is, what accommodations they might need, what locations interest them because obviously, there’s a lot of different locations, and some speak to some students in ways that others don’t. A fair number of them like to be in the mountains or on the beach – who wouldn’t? – but, you know, once that initial conversation takes place, then Holly can narrow it down to what center might be a better fit and then she’ll hand that conversation off to what we… to a position that we call the Director of Admissions and Outreach, and then that person will bring them, the family, in and they’ll tour them and talk to them about the application process and what’s included in terms of the necessary documents for applying. HR: Now if I’m a student with my own varied exceptionalities, and I’m in the College Living Experience program at a university of my choice, and I’m finding it’s helping a great deal and I’m getting through it and now I got to start down my career path, what does the College Living Experience provide for me? SM: Well, two things: We don’t dictate the path for the students, so the student could come in and they could be on an educational path and we’re going to support them; however, there are a fair number that come in and just say, “Hey, college or education is not for me. I really want to look at becoming employed,” and so we have those wrap-around supports, too, for career development, and we look at, again, assessing the student in terms of what their skill sets are, determining where the interventions or the supports are going to be needed, and then we’re gong to apply those as it pertains specifically to that student, but CLE has the career development supports that go from pre-readiness skills in terms of getting a job all the way through job coaching, so we’re going to walk them through and teach them everything from the basics of how to fill out an application, develop a resume that’s unique to a specific job… We hold workshops with our students to make sure that they understand a lot of the unwritten rules that exist in an employment setting that nobody really talks to you about. We talk about the nonverbal language and the nonverbal behavior that could get in the way. We do a lot of soft skill teaching and not so much hard skill teaching. The hard skills are what the job can teach you on the job. The soft skills are what really get in the way of a student being gainfully employed over a long period of time and so, really working with them on how to accept feedback, how to ask for accommodations, how to make sure that they understand when they need to return from a break and that it’s not when they want to but based on a time frame, and so we really work collaboratively, not just with each individual student but they work together as well to help them understand some of the rules that may not be well-defined in an employee handbook. HR: Do you run into many problems with the “getting along with the roommate” kind of situations? SM: Of course. I think that anytime that you put two people into a living environment in which they don’t know each other, it’s going to be a growing experience, and obviously there are going to be some bumps in the road, but we really work closely with our students to make sure that they understand how to navigate that process, and we have supports in place that do that. So every center has a Clinical Director, and that Clinical Director will oversee some of that, some of the interactions and the interventions to make sure that the students understand how to divvy up the responsibilities of living in an apartment with somebody who’s not your family member, how to take responsibility and ownership for what’s yours, how to voice when your roommate isn’t holding up their end of the bargain, but giving them the tools and the opportunities to experience those things in real life is going to make the difference for when they leave CLE because they may not be moving back into their family’s homes – we hope they don’t – but that they may need to have some kind of living arrangement where they are living with other folks, and so giving them that leg up is really going to help them in the long run. HR: What do you find to be the biggest limiting factor to students as you see it? What do you find is their biggest stumbling block? SM: I’m going to answer that by not answering, so what I’m going to say is that the students to come to our program and are motivated to want to learn, to understand the full scope of what those supports are going to look like, they typically really thrive, so by not answering that, the variable that are really impacts our students the most is a lack of motivation and a lack of understanding of how much effort sometimes life takes in order for them to be successful, and so what we really hope that families can do with their children as their aging up towards that transition point is to make sure that they begin to give their children responsibilities, whether that means that they’re going to do their own laundry or make your own lunch or even, when they’re littler, tie their own shoes, speak their own mind, really having families start to work on the concept of self-determination, because we recognize that when an individual is more self-determined, they have a greater likelihood for success and for thriving in the future, and so it’s okay if the student fails because they’re going to learn from that failure, and they’re going to take that experience and apply it to what happens in the future, and what we ask our families to do before they transition is let your child fail because they’re going to fail in an environment in which they are supported at home, and then, when they fail or they hit some significant speed bumps in life, while they’re at College Living Experience, they’re also going to have that support network, but we’re not going to do it for them. We’re going to help them understand how to do it differently the next time. HR: Very interesting, and you see, I would have thought the biggest stumbling block would be the socialization aspect, you know? SM: Well, it’s not to say that it doesn’t major role. I think that there are some who are incredibly social, and maybe too social, and then there are others who are incredibly introverted and struggle with that social aspect of it, but what’s nice about our centers is that the students create their own community and they’re incredibly supportive; they are incredibly forgiving and really understand how to support each other in the ways that are unique to themselves. Not every student is going to come to us with the same exact set of deficits or strengths and/or disabilities, and what we see is that they really navigate that pretty well. We support them in that process, but they navigate it really well with each other. HR: And your clientele is… it represents a whole spectrum, and I don’t just mean autism spectrum. You’ve got all the different brains in there. SM: We do. We have all the different brains in there. We have a young man who has selective mutism. Brilliant, brilliant individual is currently at a community college and will be transferring to a four-year university, and he does communicate through a pad, but it’s really remarkable to see all of the other students just thrive around him, and he is probably one of the most well-liked individuals we have. HR: And explain to our audience the terminology. SM: Selective mutism is a situation in which the person has the capability of verbal speech but she chooses not to speak. HR: We had one intern like that who’s doing great in college. we had her here in her senior year in high school, and she’s really thriving off in college now. It was very interesting. What is the breakdown of different brains, if you will? Personally, I think labels are a lousy way to describe a human being, but I want our audience to recognize that there’s all kinds of different brains and the College Living Experience can provide good help and guidance and a navigatable pathway for so many. SM: You’re right. I think that the labels are difficult because they’re relatively static in nature and don’t necessarily reflect the the unique aspects of each individual, but we serve, I would say roughly, depending on the center, between 60 to 70% of our students are on the spectrum, the autism spectrum, uh, but we serve individuals who have traumatic brain injury, cerebral palsy, attention deficit disorder, attention deficit hyperactivity disorder, and then anything and everything in the middle a fair number of our students exhibit and are working with folks to addressing anxiety, and whether that is their primary diagnosis or not, they a fair number of them also have that to deal with. HR: Well that’s why I made anxiety the first chapter in the Aspertools book, because we all have anxiety, kind of rules all of us. You know you were speaking before about the… parents needing to… start out their youngsters with responsibilities, with tasks to do, with accountability and when I interviewed our friend Temple Grandin she makes no bones about it, “get your kid a job! Get your kid a job! The earlier the better.” And… I would like to hear you emphasize again to the parents who might be listening to this or watching this or reading the transcription about how… you can’t do it for the youngster, you’ve got to let them do it. SM: You do, and-and-and that starts at the youngest age possible, and so what I think families’ intent-their intention is to make sure that their child is well and safe, and that they are free from harm; but by doing that the sheltering of those individuals teaches one specific thing, it teaches that child if they wait long enough, somebody will do it for them, and and they have a much better ability to wait adults out than any adult will ever have in waiting them out. So I think it’s important for for us as… as educators to make-to allow the parent to recognize it’s okay if their child falls down you know, figuratively. Help them pick themselves up, wrap themselves in in in the context of what happened, talk about how they can do it differently the next time, but really giving them the tools to pick themselves up and move forward, and I think that, again, that contradicts the intention of trying to keep your child well and safe and happy. But by keeping a child safe and happy all the time they’re not necessarily being exposed and in an in an effortful way to learn the skills necessary for them to become more independent. So, give them- give them responsibilities; Have them set the table, have them take out the garbage, have them clean their room. As an adult or as a parent you shouldn’t have it -have to be doing it for them. HR: Is there anything we haven’t covered Stephanie about the college living experience, and your efforts that you would like to emphasize? SM: You know, I think the other aspect of what CLE does because of our wraparound supports is, we see a fair number of students who come to us who haven’t had those independent living skills developed and those really tend to get in the way of them being successful, and and and some of those are just even understanding how to manage their own household or manage their own things; But what is really pervasive across all domains of support is the executive functioning for our individuals and how those deficits and those strengths can either really play into success or really have them struggle for a longer period of time, and so we build and support through- we build an… intentional support for executive functioning and all domains of support so then the academic realm in the independent living skills, in the social realm, all of that; because regardless of who you are we all have deficits in executive functioning and so we’ll be making sure the students understand how to fill in those gaps but then play upon their strengths in the areas that they have. I think that that would be something- is – that we really intentionally and proactively address. HR: Are you utilizing… could you speak a little bit about the utilization of technology and some of these things? SM: Sure, so in the colleges, the community colleges, they have their own supports and the students can access throughout accommodations those kinds of things at CLE, we have a fair number of things that we can do… we’re using obviously their smartphones at for everything from maintaining and holding their schedules to alerts and reminders and all of those kinds of things but we also collaborate with IBM, and IBM has given CLE the opportunity to access a tool online it’s called content clarifier; and the content clarifier allows individuals regardless if they have a disability or not to access material in many different ways and uh, so everything from changing the font to changing the size of the lettering to summarizing, to clarifying, to… it’s just it’s a remarkable tool and so we use that with our students too and helping them understand not only to gain the information they need for comprehension, but also in terms of the language that they use whether it’s an email out to an employer or it’s an email to a professor, you can run their emails through the content clarifier and it will actually measure emotional tone, and so it will in your- if your- whatever your passage is it will actually come up with a graph of whether it’s 30% happy 65% angry and so it really gives the students the opportunity to understand how some of the language they might be using is going to be misinterpreted. And so we can-it gives us the opportunity for them to go, “Oh! I didn’t mean it that way, this is what I meant” and they can re-formulate the email or the the correspondence, so that’s something that we’re currently using. HR: How can people find out more about you and the College Living Experience? HR: That’s great. Stephanie it’s been wonderful if we can do anything here at Different Brains.Org help spread the word we will be very glad to. HR: And keep up the good work you’re doing for so many. SM: Thank you! I appreciate it. 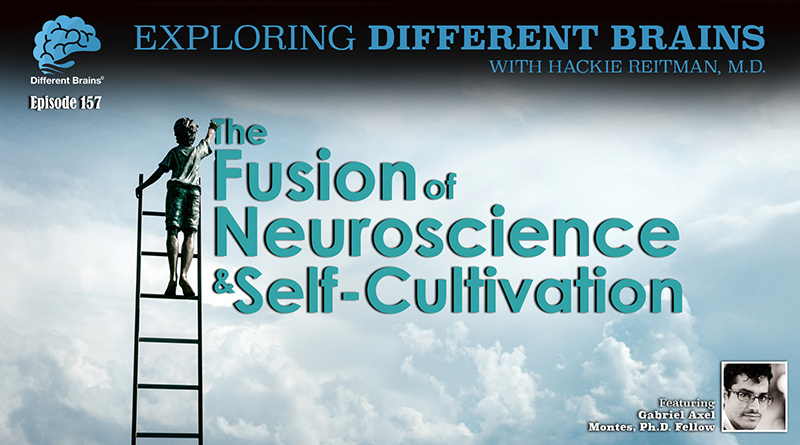 (26 minutes) In this episode, Dr. Hackie Reitman speaks with Gabriel Axel Montes, educator, scientist, and founder of Neural Axis.